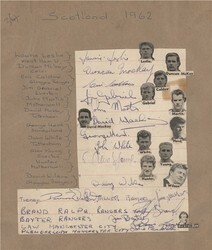 A vintage page clipping containing 16 autographs of the 1962 Scotland National Football Team. 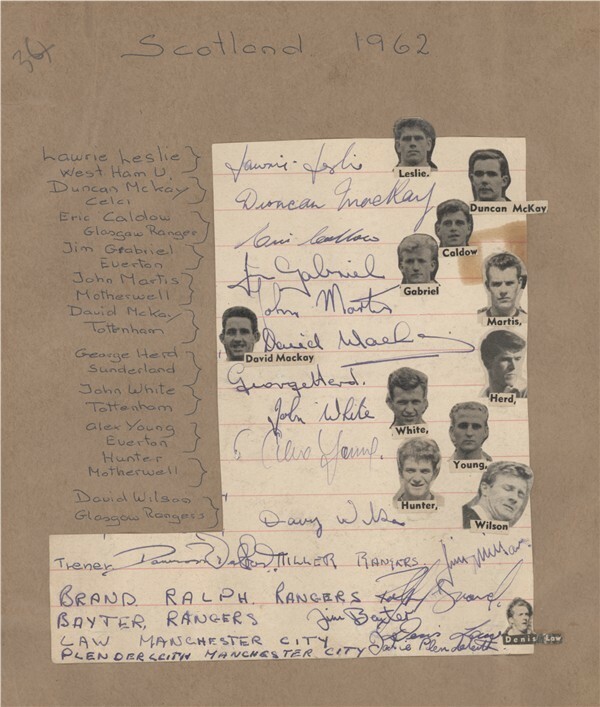 The autographs include the likes of the great Jim Baxter (died 2001), Denis Law, and the late John White (died 1964), regarded as one of the rarest autographs in British football. The lined paper clipping has been attached to a 10x8.5 scrap book page. Miniture 'head and shoulders' cutouts have been attached to the autographed page, a popular trend in 1950's, 60's autograph collecting. The autographs all HAND SIGNED in blue ink consist of Lawrie Leslie, Duncan Mackay, Eric Caldow, Jimmy Gabriel, John Martis, Dave MacKay, George Herd, John White, Alex Young, Davie Wilson, Jimmy Millar, The Trainer (name unknown), Ralph Brand, Jim Baxter, Denis Law & Jackie Plenderleith. An extremely rare, highly sought after collection of autographs. This item is in absolute mint condition and comes complete with our life time guarantee UACC/AFTAL Sports & Star Autographs Certificate of Authenticity.